Juan and Pedro are best friends. They are the same in age and lived in the same neighborhood. They went in the same school. They played together, they studied together. But when they finished college, they were separated. At the age of 20, Juan went to Manila to work in a manufacturing company. Pedro on the other hand, worked in a small company in their city. During the same period, Juan learned how to save and put his money in a place where it earns 12 percent interest per year. He puts P20,000 every year for 7 years. At the age of 26, the company of Pedro expanded in Manila and he was sent to work with the team. He met with Juan on his first day at work. Juan learned that Pedro was not saving so he shared what he is doing. Pedro also invested in the same place where Juan put his money, investing P20,000 every year. During that time, Juan volunteered to join a non government organization in a remote area in Africa, thus stopping him to invest continuously. After 7 years, at the age of 32, Juan called Pedro and asked him if he wants to join him to be a volunteer. Pedro answered with eagerness to join Juan. Because of this, Pedro also stopped investing. Forty years later, at the age of 60, they decided to retire and go back to the Philippines. So they went to the investment house where they put their money. Juan passed out upon hearing the amount. They went home, put up their business and enjoyed their retirement. 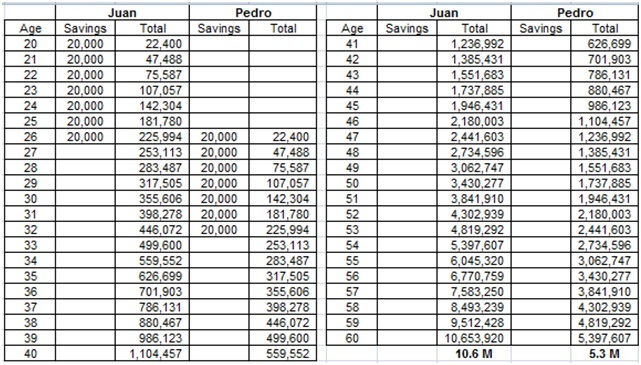 You can see that the money worked both for Juan and Pedro because of the power of compound interest. But it worked better for Juan because he saved early. There are two reasons why this happened. Reason 1: The earlier you save the greater the result. Time is an ally of money. It can give you great earnings if you save early. But it can also be an enemy if not used properly. Procrastination is the problem. 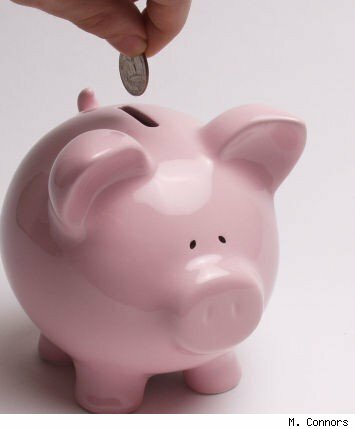 If you let time passed without considering on saving a portion of your income, you will realize the consequence later. Reason 2: You should know where to put your money to maximize the power of compound interest. There are different investment engines that can make your money work as hard as you do. You should seek proper financial education and the right information on these. You can achieve financial abundance through literacy and discipline. Always remember that what you do during your productive years will determine what life you will have in the future. 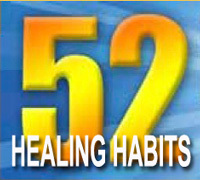 You have the power to make your life miserable or happy. And you should choose to be happy. Reflection: How will you make your life happy in the future? PS1. I would like to thank International Marketing Group (IMG) for the financial concept I shared with you in this blog. PS2. We are conducting free financial check up to guide you in attaining your financial goal. Check the details here.